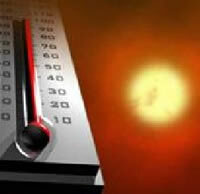 Heat Wave Rolling Into Charlotte Area, Are You Ready? Memorial Day weekend is here and it looks like the Charlotte area weather is going to provide what can only be described as a warm welcome into summer! With temperatures forecast to reach into the 90’s this holiday weekend and the added bonus of race weekend being here, we wanted to share some of our more popular articles with you, just in case you need them! If your AC is working, but you just can’t get cool in your house, learn why it might be happening, and what you can do about it. In addition to the heat, we have that tropical storm to worry about… hopefully, it won’t effect your weekend plans! Things You Can Check While Waiting for the Repairman to Get There. One of our Satire Articles is always worth a laugh at this time of year, 20 Ways to Get AC Repair Fast! We Hope You Have a Happy Holiday Weekend! Great points. Although I woldun’t touch with the freon line unless your certified, because that releases environmentally toxic stuff into the air. And your lungs are vulnerable, so be sure to wear a mask if your purging contaminants. Great job, and interesting post.